Chaos Created is proud to announce that the new web site for Uniross, a global company specialising in batteries (in particular, rechargeable batteries) is now live. The site went live with a European version late last year but today we pushed out the global roll out, in both English and French. We worked closely with Uniross’ design team to bring their brand new global identity to the web. 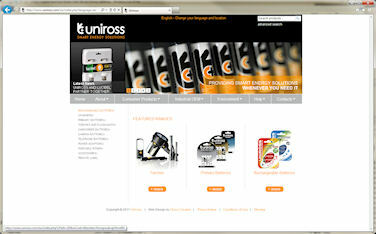 The web site features a catalogue featuring Uniross’ full range of products, localised depending on region. From a technical aspect, Uniross’ global offices can access the admin panel for their region and maintain their own localised catalogue and news sections. We look forward to working with Uniross in rolling out the site with more localised versions in the future. You can visit the site today at http://www.uniross.com.